Recently the internet was flooded with a video showing that anybody can listed your conversation using Face Time. Face Time is an official app for iOS which let you make Video/Audio calls over VoIP. Unlike WhatsApp and Facebook messenger Apple phones come with their own dedicated video call app. After the recent FaceTime bug, which lets any caller listen to your conversation even if you don’t pick the call. The bug has put all the iPhone users in real peril. Unfortunately Apple has not initiated any step o fix this bug. 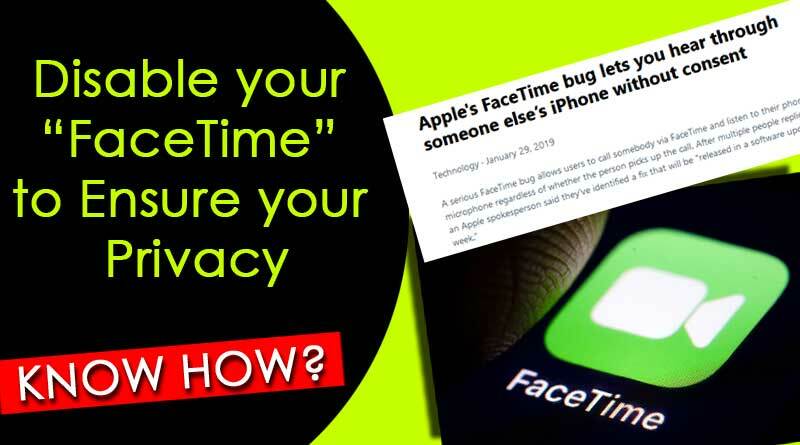 So, its better to disable the FaceTime to ensure your privacy until the bug gets fixed. It is advised to keep a sneak peak on your phone and look who is calling. And try to either disconnect or respond the call. Not let the hang FaceTime call for a while.